This is an unusual book review in that it is also an event review as well. 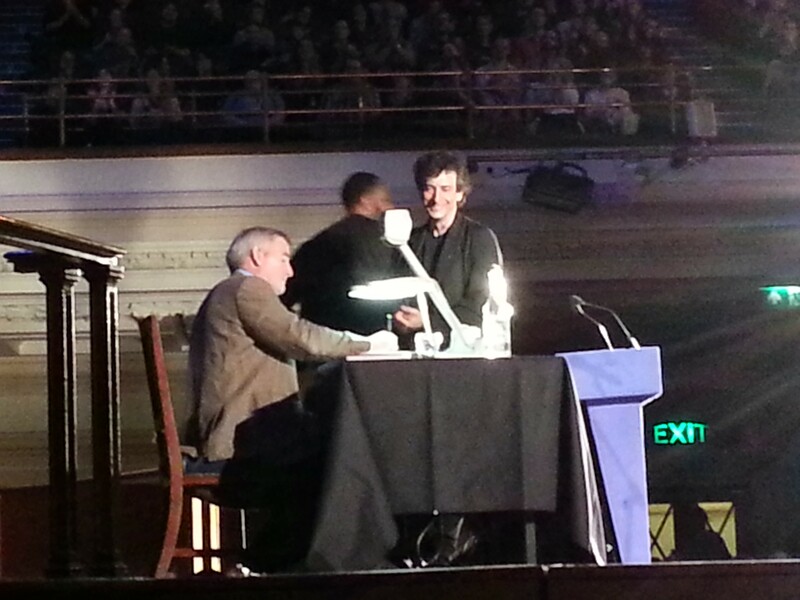 I took my son (the day before his 8th birthday) to see Neil Gaiman and friends read Fortunately the Milk… on stage at Westminster Central Hall. It was an awesome evening, we arrived to find the place literally surrounded by Neil Gaiman fans, as the queue went all the way round the building. The general entertainment was every bit as good as the main event. We both laughed a lot at the introductory piece by Andrew O’Neill who really worked to warm us all up. He did a good line in geeky jokes, I particularly liked his line on Magneto on a Lilo. The boy almost wet himself at that and then got terribly excited when Andrew had half the hall stamping their feet and the other half clapping to his pointed finger. This lead, inevitably, into a quick rendition of We Will Rock You! All fabuluous stuff, and followed by some music and then the reading itself. Neil Gaiman’s blog says it all. The only other thing to add is that Alexander has told everyone he knows about how awesome it was in the last few days since he went and was still telling his friends after his birthday party (which involved fires, sticks, bow and arrows, etc in the garden and deemed by the cohort to be the most awesome party ever) how good Fortunately the Milk was, and he’s read it again twice in a week. The story is a very entertaining one of a father that is looking after his two children while his wife is off on a business trip to a conference. They manage to run out of milk before breakfast and the father pops out to get some. It takes some time, and on return the father explains the reasons for the delay to his children, weaving all of their visible toys and pictures into his story. It is, as one might expect from Neil Gaiman, very cleverly done. There are a number of amusing pastiches of various things throughout the text. I particularly liked the Wumpires, and the references to the Twilight saga. There was also a touching reference to Terry Pratchett in the name of one of the police dinosaurs being Pterry. This is a children’s book, but it is very entertaining as an adult, I managed to sneak a read of it when my son wasn’t reading it himself. Unfortunately for me he can now read well himself, and so I won’t continue to be entertained at bedtime by reading it to him. He has enjoyed it very much and has re-read the book twice in the space of a week. We have the special limited edition produced for the reading, which was signed by both Neil Gaimain and Chris Riddell. The book is generously illustrated, with a picture on most double pages that really adds to the story telling. There are also character sketches in the end papers. I thoroughly recommend that you get yourself a copy of this book and read it to any children you know. We have an obligation to imagine: Neil Gaiman on Reading. Brilliant.